One of the toughest parts of getting out of debt is finding extra ways to save when you’ve already cut your spending to the bare minimum. It may seem like there’s no other option apart from exploring ways to earn more money, but there is something you can do. You can save when you spend. 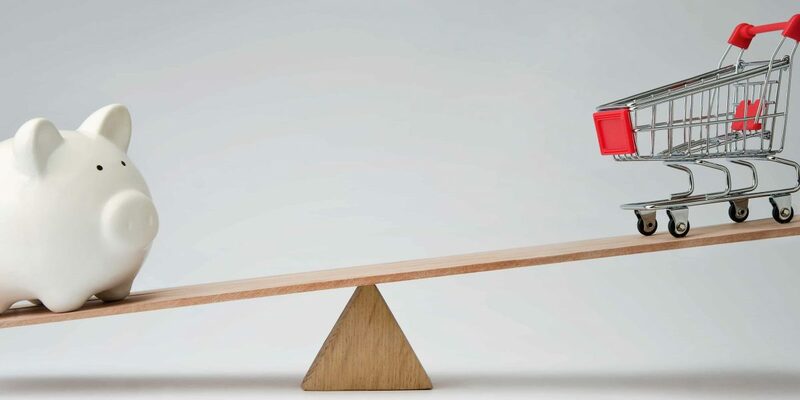 It may seem counterintuitive to think of spending when you’re looking for ways to save, but by optimizing your spending you can reduce the total outflows so you have more left over. Probably the most obvious way to save when you spend is to use coupons. I’m not an expert couponer, but I do make sure to join the reward programs for the stores I shop, especially for groceries. Just by being a member you can get advertised discounts without clipping anything. If you do a little extra research you may find even greater savings without much effort. 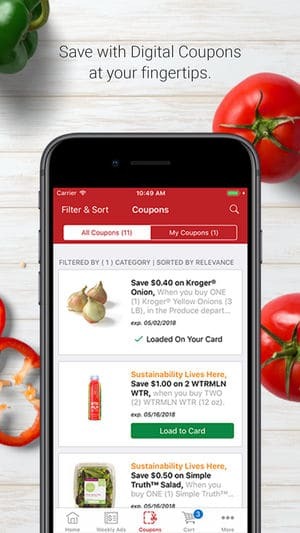 My grocery store has a mobile app that allows me to quickly and easily load coupons straight to my card. Add to this the targeted coupons they mail to my house and my bill always drops by a good chunk after the cashier hits the total button. In addition to using coupons, don’t forget to check for sales. The app Flipp puts all your local store fliers right on your phone so you can quickly see which stores are having sales and on what. 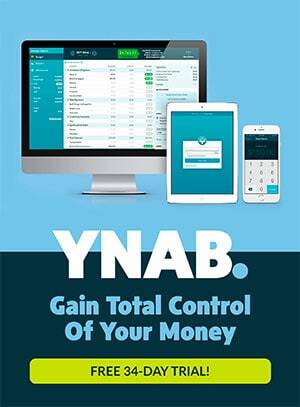 It’s a great tool for researching local deals. Not only can you scan through to see what’s on sale but you can also search the items already on your list to find a store that’s got it on sale. 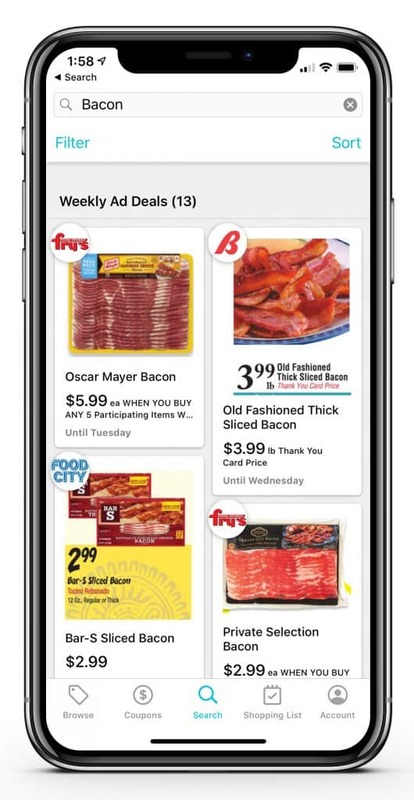 Pull up Flipp, do a quick search for bacon and see which stores are having a sale nearby. Awesome! Another great way to save when you need to spend is to use discounted gift cards. When you know you’re going to be shopping at a particular store, stock up on discounted gift cards ahead of time to have a built-in discount. There are a few ways you can find discounted gift cards. First, check membership clubs like Costco and Sam’s Club. They usually have some good discounts, but the selection may vary throughout the year. Second, check your grocery store’s app for any discounts or other benefits (like fuel points) they might offer with a gift card purchase. My Fry’s app always seems to have deals on their gift cards, but the selections aren’t always what we need. Third, if you have a Target Red Card you can get the 5% discount on gift cards purchases. While 5% isn’t as great as what you may get at other stores, at least with Target your selection is pretty wide. Fourth, PayPal often runs sales on their gift cards purchased through their eBay store. You can get great deals this way. Sometimes as high as 25% off. Finally, you can use sites like Raise.com and GiftCardGranny.com to buy directly. 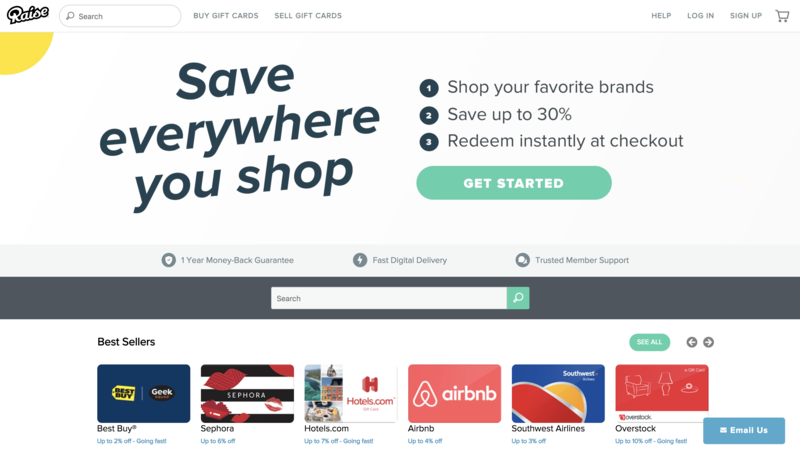 There are lots of discount gift card websites, but those are the two I’ve used. If you chose another, just make sure you check their policies and guarantees to make sure you don’t get ripped off. It may not feel like saving in the traditional sense, but using credit cards with reward points can add up to future savings, especially with cash back cards. Our Citi Double Cashback card provides 2% cashback on every purchase. Discover offers 5% in certain categories that change quarterly and our Amex Blue gives 5% on groceries and 3% on gas. You’re basically earning money when you spend on cashback cards. I usually cash out my points for statement credit but some cards offer the option to redeem points for gift cards. You can often get extra discounts by shopping through the credit card’s shopping portal. 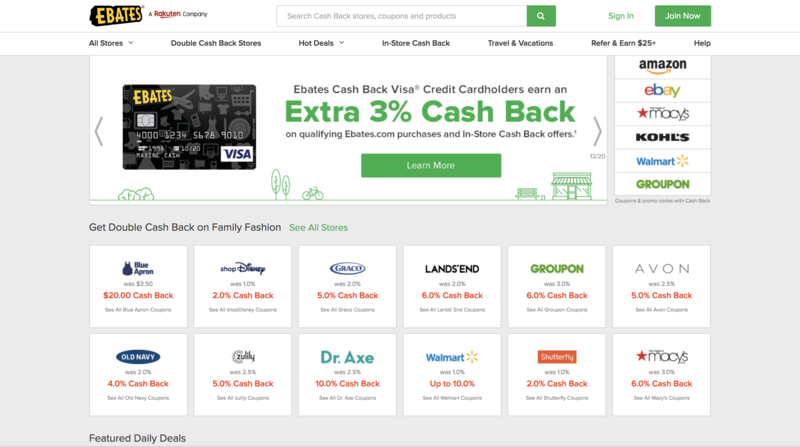 Also, check your account homepage for cashback offers with purchase (for example, $5 off a $20 purchase at select vendors). My Amex cards display offers this way so if you have an American Express card it might be worth logging in to check. Buying online offers even more opportunity to save when you spend. Not only can you combine all of the methods above, but you can also use rebate sites, browser extensions, and price trackers to lower costs even more. Rebate sites are a great way to save effortlessly when shopping online. 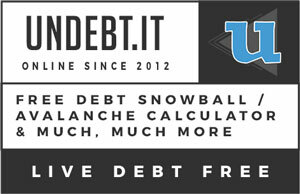 There are several programs you can use such as Ebates, Upromise, and Swagbucks. The amount of shopping and how much you’re spending (as well as how you’d like to receive your savings) will determine which service you want to use and whether it’s worth your time to sign up for multiple ones. Ebates is the one I use the most for simplicity sake, but their rebate percentages are not always the best. 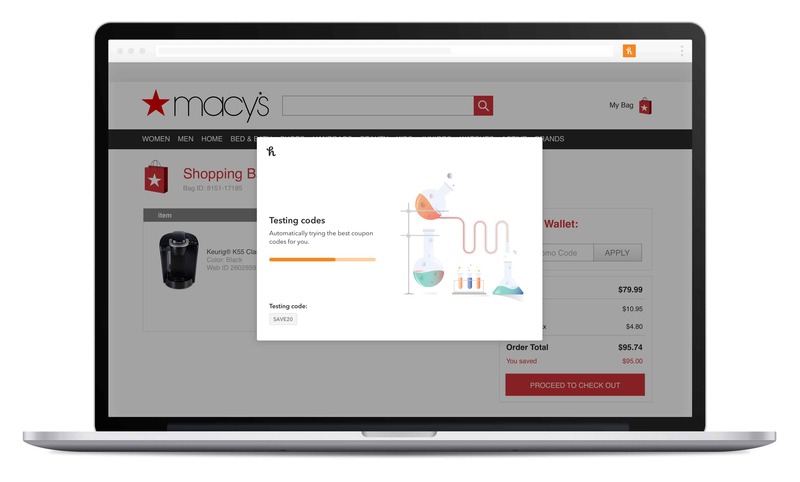 You can use this Chrome browser extension if you want to see how different rebate sites compare while you’re shopping. Each rebate site should also have their own browser extension to help you remember to “click through” their site to get your rewards. Speaking of browser extensions, apart from using them for rebate sites, you can use them to automatically find and apply coupon codes. I used to look for coupon codes by searching Google “store name + coupon code” and then painstakingly try each code out to see if any worked (frustratingly, most didn’t). But now there are extensions that do the work for you with a simple click of a button. I’ve been using both the Honey extension and the Piggy extension to try to find deals. Both have libraries of discount codes they test and apply to your cart to get you the best deal all with a click of a button. Another great tool if you’re shopping for something specific is to use a price tracker. 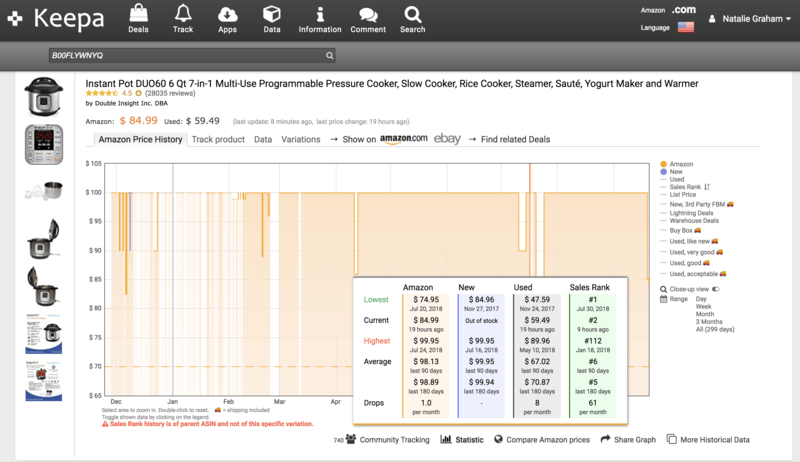 Sites like CamelCamelCamel and Keepa have years worth of pricing data for Amazon products. You can search for your desired product and see how the price has changed over time. With a little analysis of their charts, you can get an idea of when the item tends to go on sale and evaluate if the discount is worth the wait. To ensure you don’t wait in vain, these sites offer pricing alerts that can email or message you when the item you’re tracking has dropped to your target price. While these sites are specific to Amazon pricing, many times the price changes coincide with other large stores’ discounts or might be useful in price matching if you prefer to buy in a store. 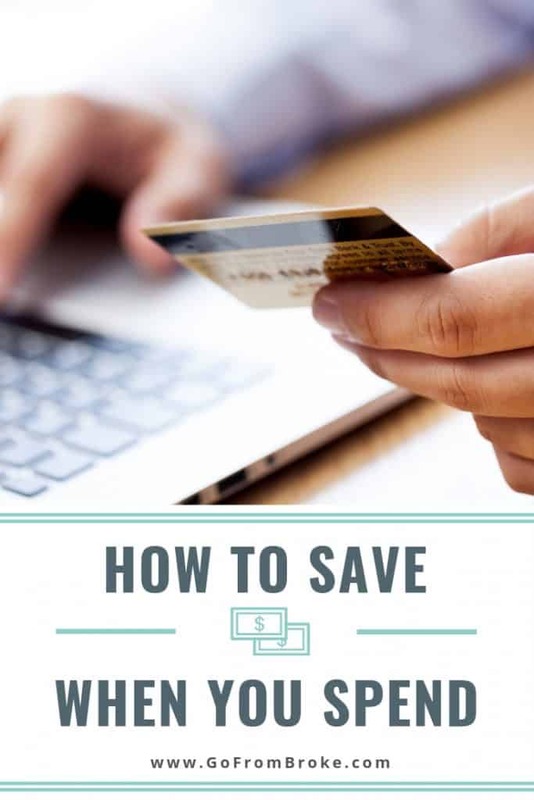 One final tip is on how to easily save money even after you’ve spent it. Paribus and Earny are a couple of different services that will monitor your email for purchase receipts and track the prices looking for future drops. When they discover price drops they’ll automatically appeal to the vendor or your credit card for a refund of the difference. Cutting your spending is probably the easiest way to save money, but when you have to spend, you might as well spend as little as possible. 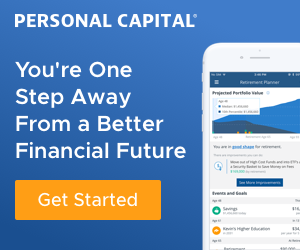 Hopefully some of the methods and apps above will help you save more and reach your financial goals faster. Let me know if you know of other ways to save when you spend! Want to remember this? 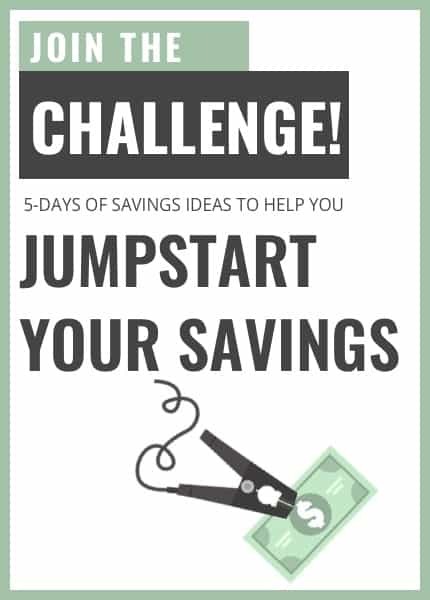 Save How to Save When You Spend to your favorite Pinterest board! Pinned it! Love the gift card tips! Thanks! Hope it helps you save some money! GoFromBroke.com is a participant in the Amazon Services LLC Associates Program, an affiliate advertising program designed to provide a means for sites to earn advertising fees by advertising and linking to amazon.com.